Hello friends today i am going to tell you about youtube alternative So friends ready lets start. Today i am going to telling you about best youtube alternative which are the best alternative sites. 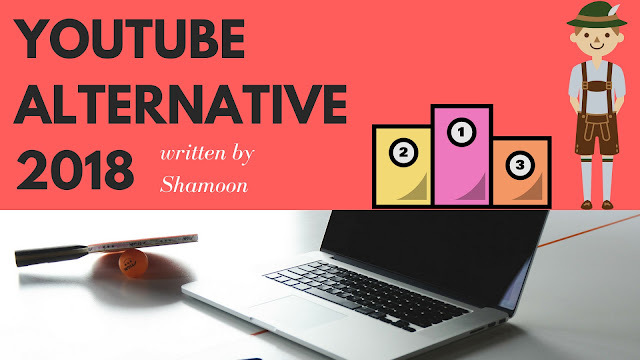 Dtube -d tube is the best youtube alternative and best site for earn money by uploading videos like youtube d tube is also uses Adsense and gives money to users.Its a good platform for earning money. vimeo- Vimeo is also a good platform for uploading videos and its a professinol platform its easy to use and make money easily by it. try it. dailymotion -This is my favorite site is used it its a professinol site for uploading videos and it is the best youtube alternative. veoh-its a good site for earning money and good alternative of youtube. metacafe-this site is very nice because i used it and result very nice professinol and best platform also a youtube alternative. On Youtube their are 100 million+ channels but all are not success so if you are not growing on youtube so dont worry on google here is more sites like youtube use them and earn money but if you uploads bad videos and your content is not user friendly so you will not grow on any platform so first you should to improve your content and mistakes. I suggest you for dailymotion because i use dailymotion and its earning and traffic are very good than other websites this is second biggest video sharing website in the world after youtube in dailymotion you can monetize your videos and one thing that is my favorite you can monetize your site from here wao its amazing on youtube you can only monetize your videos but here you can monetize your website/blog by dailytmotion how? You can read our full article about dailymotion site and get full information about it. I have a blog sir I have a question. yes .ooo domain is a top level domain and it is seo friendly domain you can try it. Bhai .ooo domain me adsense approval milega kya??? Ha bhai jaroor milega .ooo is a top level domain hai.